Apparently, I snore like a chainsaw. Like many people faced with this sleeping situation, my wife has resorted to kicking me until I stop. 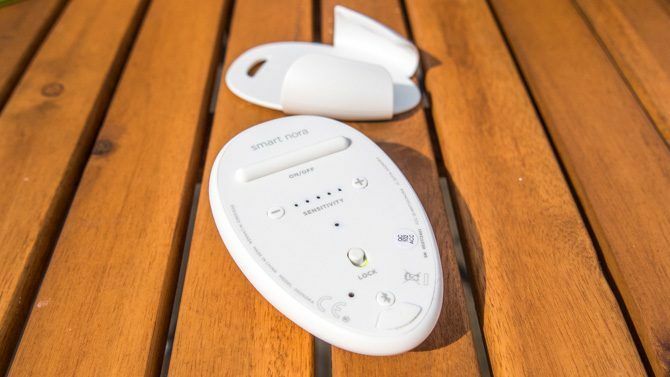 SmartNora–a device that began as a Kickstarter–has completely fixed that. When it detects snoring, it nudges my head up and down, clearing the airways and stopping the snoring. It’s a non-invasive solution to an age old problem, and it’s become a bedtime essential in our house. 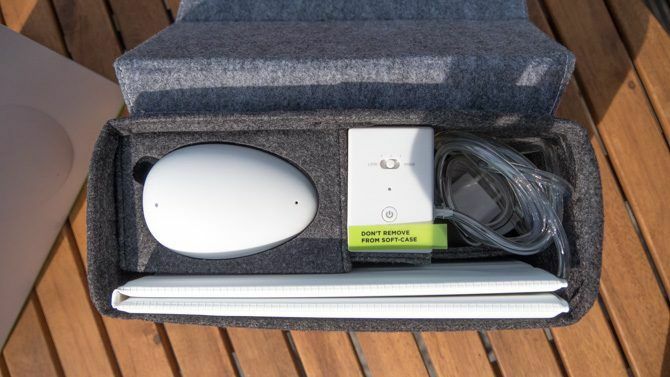 The Smart Nora costs $ 300 direct from SmartNora.com. Anything that can get some precious sleep time back is worth every penny. Join us as we take a closer look at exactly how the Smart Nora works, and at the end of this review, we’re giving one away. There’s quite a lot of unfamiliar tech in the box, so let’s break down each component. Everything is housed inside a sleek felt-covered case measuring 4 x 7 x 10 inches. Integral to this case is the air pump in the center. Don’t try to remove this from the case, as you may damage the unit. The whole box should be placed under your bed in normal use, but you’ll need to unpack the other bits first. 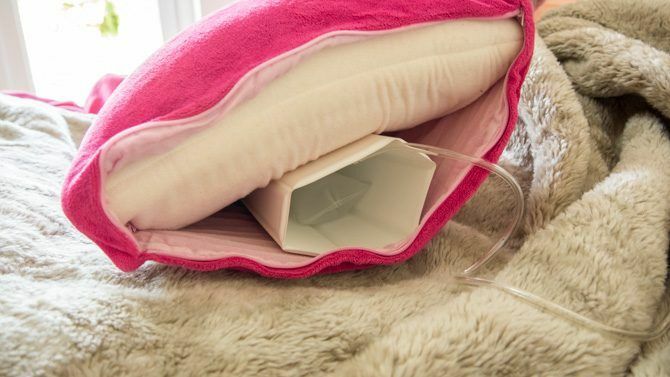 In the largest pocket, you’ll find the pillow inflator with attached hose. This consists of stiff outer plates with small plastic air pillows on the inside. 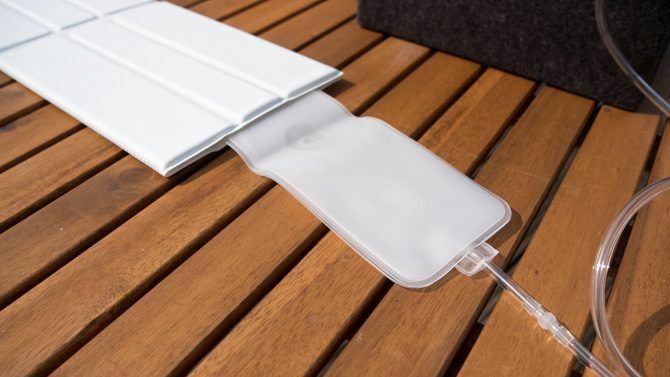 The design allows a small amount of air to move your whole pillow. Unfold this, and place it under your pillow or inside the pillow case, with the tube facing the outside. If you received a comfort sleeve, you can put the inflator inside this. 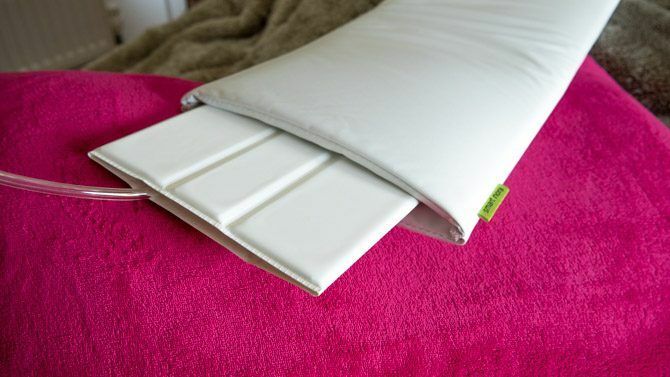 This step is optional, but adds a little extra padding if you’re using particularly thin pillows. You’ll find the Pebble wireless sensor on the left, as well as a mounting bracket elsewhere in the box. Ideally, the sensor should placed no more than 4 inches above your head, mounted to your headboard. If this isn’t possible though, you can also place it on a bedside table, no more than an arm’s length away from your head. The Pebble houses the microphone, but is also your main interaction point with the device. Also in the package is a Micro USB cable, and mains power lead. The Micro USB cable is used to syncronize and charge the Pebble sensor unit. The battery lasts for approximately a week. 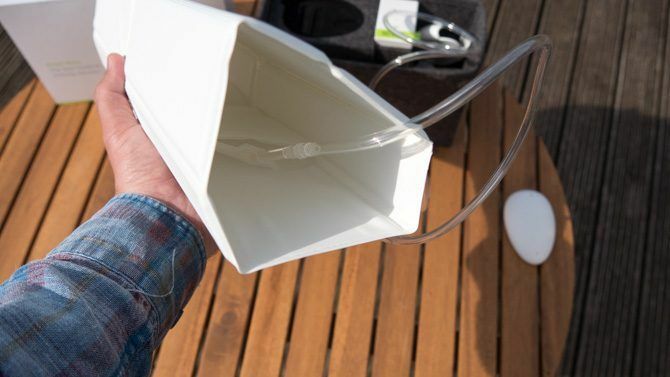 The base unit itself also houses a battery for the pump. This is intended only as a backup or for situations where you just don’t have mains power, like camping. In normal situations, the base unit should be left plugged into the mains at all times and turned on. 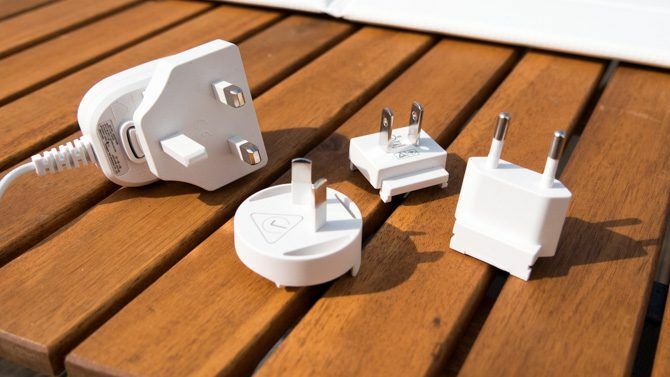 I’d really like to commend them on the inclusion of 4 different easy-to-swap plug adaptors. 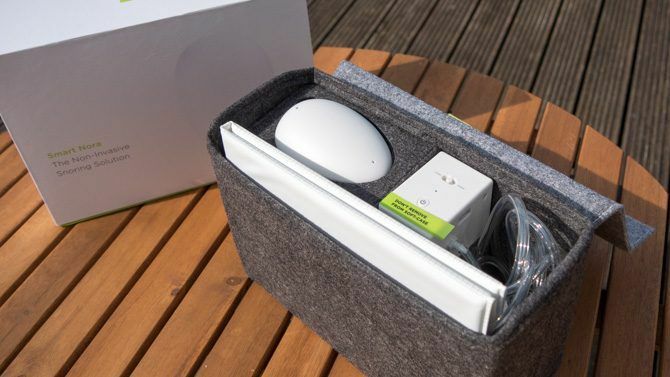 Combined with the fact that everything can be packed down into itself, the Smart Nora is ideal for travelling. You needn’t lose sleep just because you’re not in your own bed. Once you’ve got the base unit plugged into mains power and the tube connected, turn on the main power button. Then unlock the Pebble with the slide switch underneath. To pair the Bluetooth, plug the Micro USB cable from the Pebble into the base unit. You should also leave it plugged in for at least three hours if this is the first time you’ve done so. It’ll flash green when fully charged, or red when the battery is low. If you want to go ahead and test the inflation, tap on the Bluetooth button underneath the Pebble. Apart from the initial setup, daily operation couldn’t be simpler. Each night before bed, all you need to do is tap on the Pebble to turn on the device. Hold down for a second to activate with the 30 minute delay. That’s it. The delay is useful if you find Smart Nora is waking you while still trying to fall asleep. I have no trouble falling straight asleep, so I didn’t need the delay. On a few occasions, we experienced a flashing blue light. This means the Bluetooth connection has been lost. Plugging in the Micro USB cable again will fix this. How Does Smart Nora Actually Work? To detect when someone is snoring, a sensor is needed: in this case, a microphone, housed within the Pebble unit. This listens carefully for the light snoring that usually precedes really loud snoring. Then we get to the really clever bit: a flat, unobtrusive air sack is placed under the snorer’s pillow. When snoring is detected, it gently inflates then immediately deflates, causing the snorer head to move. This adjusts the airways in your neck and throat, allowing air to flow freely, which stops the snoring. The whole inflation and deflation process takes about a minute for a full cycle. The pump is whisper-quiet. I could hear it while testing it in the daytime if I put my ear right next to it, but it’s not loud enough to wake me up when sleeping. Even less so when placed under the bed. For the first few days, it was more the sound of the air sacks inflating that would wake me. Smart Nora is the first device to use this completely novel approach. Yet, some reviewers have criticised this reactive method. In order for Smart Nora to work, it must first hear you snoring, by which time your partner may have already woken up. It’s not a proactive system that will stop you snoring in the first place, nor will it correct any underlying health issues. In fact, it’s more or less exactly like your partner waking up and nudging you–but it’s automated and a lot gentler. We found this reactive method worked well. In most cases, she didn’t wake up at all, because the Smart Nora caught me snoring before it became loud enough. On the rare occasion she did wake up and saw the pillow kick into action, she could immediately fall back to sleep. It’s the process of actively engaging your brain and resetting that sleep cycle that causes real sleep loss. This happens if you need to shove your partner a little, or lie in bed waiting for them to stop. The Smart Nora avoids that situation. 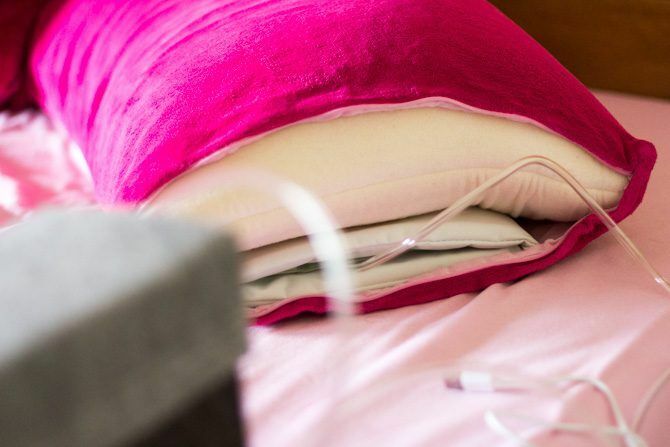 This Smart Nora’s unique approach means you can use it with your existing pillow. The Pebble is unobtrusive, and you needn’t adapt to anything weird being strapped to your face. The entire system is so discreet that no one will even know it’s there unless you point it out. There’s two settings that you’ll need to tweak in order to find the best setting for you. On the base unit you can set three different inflation strengths. These change how much air is pumped in, and consequently how high your pillow will rise and fall. We found the highest was almost comical, pushing my head from horizontal to completely vertical. Medium was perfect. On the underside of the Pebble, you’ll find 5 levels of sensitivity for the microphone. The highest setting will activate immediately with the slightest noise. It should only be used in the most quiet of bedrooms. The lowest setting will only activate if it hears very loud snoring, multiple times. It can be used in very noisy rooms. The medium setting with be suitable for most people, activating with multiple snores, of normal loudness. If your partner is very sensitive to your snoring, turn up the sensitivity so it activates faster. Are There Any Cases Smart Nora Won’t Work? There are a few situations in which Smart Nora will be less effective. If you sleep with a white noise machine or similar, you’ll need to reposition things. Make sure the white noise is further away from the Pebble microphone than you are. Set Smart Nora on low sensitivity, and it’ll detect only the loudest noise. So as long as you snore louder than the white noise, it should still work. Fans or air conditioning can also be an issue. If you’ve ever tried blowing into a microphone, you’ll know how noisy it’ll be. Ensure the airflow isn’t pointed at the Pebble, and it should be fine. The ambient noise from a fan or aircon alone won’t be enough to cause unintended activation. Even if it does, the motion isn’t intrusive enough to wake you. Lastly, remember that it works by raising or lowering your pillow. If you’re the kind of person who slips off the pillow, it won’t do anything for you. The opposite is also true: if you hug your pillow tightly, it may wake you up. Promised very soon is an accompanying app. 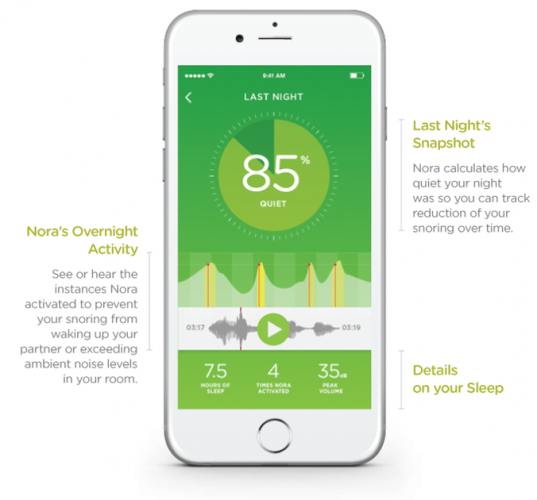 It’ll be launching on iOS first, giving “additional insights into your snoring”. Exactly what that entails is not yet clear. Unfortunately, the delay has angered some Kickstarter backers, since it was an integral part of the campaign. To be clear, the Smart Nora system functions fully without an app. It’ll still stop you snoring. It just doesn’t take full advantage of the Bluetooth capabilities built into the system. Think of it as an added bonus coming at some point. For some people, snoring can be a debilitating condition. Loss of sleep is no laughing matter, and for couples it can drive a literal wedge between them. Some will spend many thousands of dollars trying to fix the problem to no avail. You’ll funny shaped pillows, pills of every color, masks, and mouth gags – none of which really work, are utterly uncomfortable, or are so expensive that they’re unaffordable for most people. Smart Nora recommend a week to fully get used to the system, but they also have a 30-day money back guarantee in case it doesn’t. That said, it only took a few days for me to acclimatise. The results were fantastic–or so my wife says. I’m a heavy sleeper, so while it’s stopped my snoring, I’m ultimately not the one seeing the benefit! Snoring is a problem with many causes and many forms, so I can can’t say the Smart Nora will 100% work for everyone. All I can say is: it worked for us. 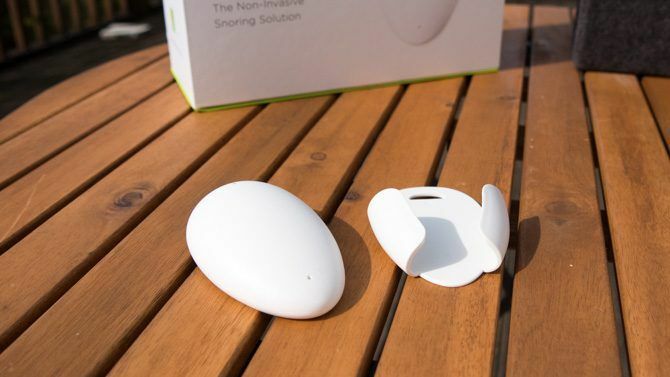 If you or your partner are losing sleep from snoring, I would absolutely recommend giving the Smart Nora a go. It’s a surprisingly simple approach, but it seems to actually work. Smart Nora is a bedtime must-buy.